Double digging is the best way to turn a tiny yard into a year round gourmet delight for your family and the ecosystem as a whole. To double dig is simply to mix compost deep into the ground before you plant. Typically I’ve seen landscapers and gardeners mixing compost in soil to a depth of between six inches and one foot when installing a new garden. This is fine if you have plenty of space to produce your food in, but anybody who’s grown a healthy zucchini in a city yard knows that every inch of space can count. In order to double dig, mix your compost into the ground to a depth of between two and three feet. The deeper you dig in the compost, the more room there is for the roots to grow down deep instead of outward along the surface. When roots have room to grow deep, plants can be placed closer together, thus making your yard able to produce more food! Once you have mixed your soil, you’ll never need or want to turn it again, instead you can add compost as a top dressing for your gardens every spring. Trash to compost, compost to earth, and earth to dinner plate, now that’s a cycle we can all live with. The hops vines shown in right side of this picture grew 12 feet in a single season due to the 4 foot double dig we did before we planted. 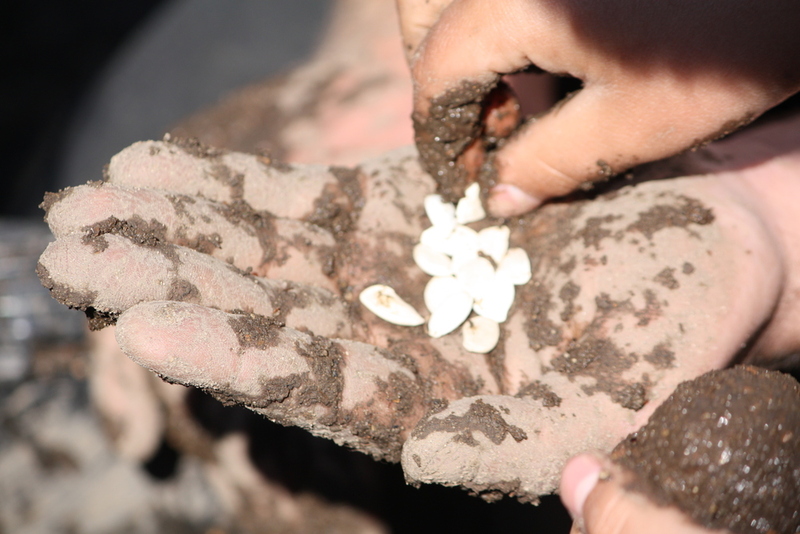 Seeds are like currency. You can’t get food without them. So it makes sense that the more variety and volume of seeds that you have the more solid the guarantee you have that your shelves will be stocked. We need to make sure that We The People are in charge of our seeds. We need to grow independent of big seed producing companies, so that we get to choose our local food selection. Store your seeds in clearly marked envelopes inside of plastic zip lock bags, air tight containers, or mason jars with tight fitting lids and place them in cool, dark, dry cupboards or boxes. Secret #3 is perfect for gardeners with sandy soil. There is an old farmers rhyme that comes handed down from generations before to help us remember: "Sand into clay is money thrown away, but clay into sand is money in the hand". What these wise farmers of old would have us understand is that while you won’t get any benefit from adding sand into clay soil, you will get benefits from adding clay into sand. Clay will help retain moisture in a sandy or loamy soil. If you mix clay soil with a little of your compost before spreading the compost you will give your garden all it needs to grow up healthy and strong right from the start. Clay soil is fairly easy to procure in small amounts throughout the twin cities area, if you don’t know a farmer or developer who will let you scoop enough for your sandy gardens, than I’d recommend consulting with Craigslist. 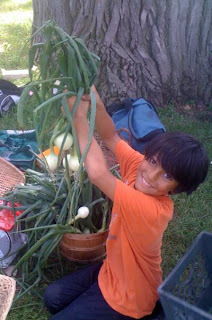 Are you an you an urban farm CSA member in 2013? SIGN UP HERE and mention the name of the Urban Farm that you support to redeem your $50 off coupon! 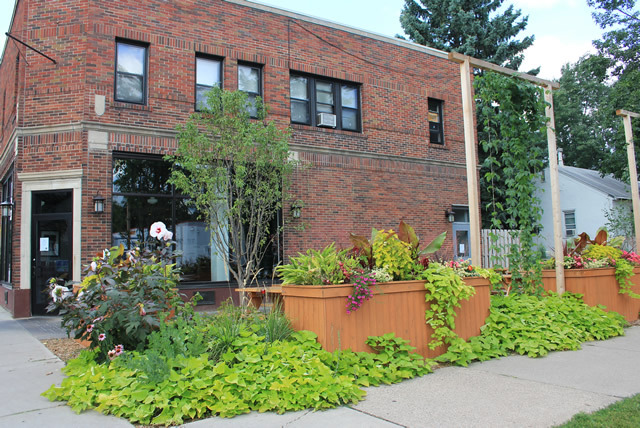 Giving Tree Gardens has been busy building some exciting Minneapolis landscapes this summer. This pizza-oven and natural stone patio installation is the latest and greatest portion of the newly renovated Permaculture-made-pretty backyard living space at the Loomis residence in NE Minneapolis. Team work pays off and this project brought together a great team of creative and skilled builders. The lovely and functional pizza oven you see here was hand built by Minneapolis' own Frances Michaelson with rooftop construction help from her father, Paul Sylvester. Click here to veiw pictures of the oven construction. 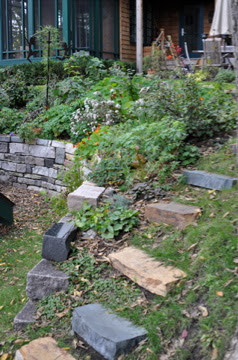 Built from locally sourced materials, including re-used street pavers, clay and sand from clients yards, beaver hewn logs from the Mississippi River's edge, and re-used tin roofing, this is an Earth-friendly permaculture landscape installation. The pizza oven, patio, and roof-top are just a portion of the many changes that this back yard has undergone in one season. A Chicken coop, compost bins, fruit trees, a quaking aspen grove, rain-barrels, and butterfly gardens are all newly in place in this sustainable landscape. For those who are wondering, you too can have a pizza oven built in your backyard. Click to view this page to learn more about our Backyard Pizza Oven services. Or Click here to schedule a home landscape consultation. 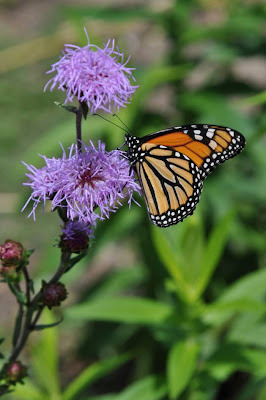 Here are some images of a butterfly enjoying the Joe Pye Weed in our gardens. Gotta love a friendly garden visitor! The Parker residence in Edina, MN was once an empty lawn. Teeming with birds, butterflies, bees, and beauty, this backyard now reflects natures abundant bounty. Two rain-gardens, a stone patio and stone walkways, and large butterfly gardens that all define this healthy home landscape were all installed only 3 years ago. As a testament to the power of good compost the trees, shrubs, and perennial habitat plants in this native landscape have matured at a much appreciated rapid pace. The Sorensen residence in St. Paul has become a refuge and home for bees and butterflies. Giving Tree installed these beds in May 2012, these pictures taken in July show the strength of good compost in the soil. 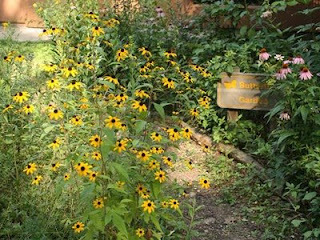 Plants in these beds have grown with wild abandon and are already supporting a wide variety of bees, and butterflies. The Sorensen's love their bees so much they made a blog to help us all follow the buzz! Even a professional gardener needs a place to sink his hands in the dirt and unwind at the end of the day. 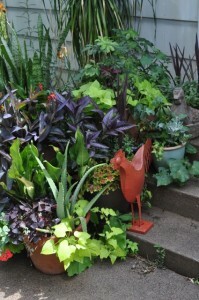 Here's a few pictures of the front yard gardens at my Minneapolis home. Click on any image in the gallery below to enlarge. Organic gardening and farming are based on the notion that when we build our soil’s natural fertility through composting we strengthen our environment and grow the land’s capacity to provide us with health. It’s a pretty good system when you think of it. We throw out scraps, and the scraps become our food. So simple, so elegant, so effective. At Giving Tree Gardens, we’re such big fans of compost because we’ve seen it’s powerful results. Our gardens and lawns have all quickly filled in and grown with health and beauty using nothing but good healthy compost for fertility. 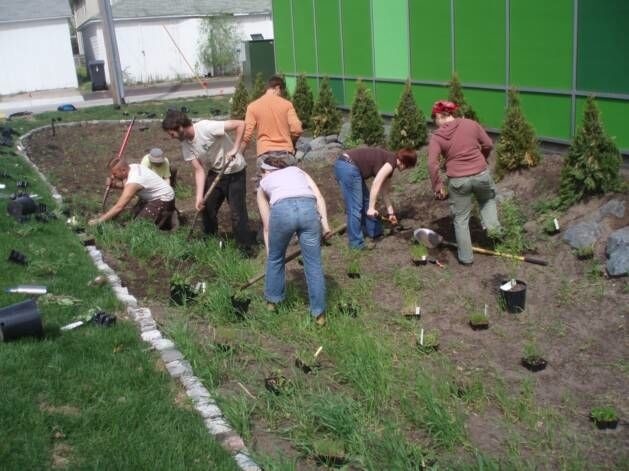 Last spring Giving Tree Gardens began working with farm partners to build Grow! 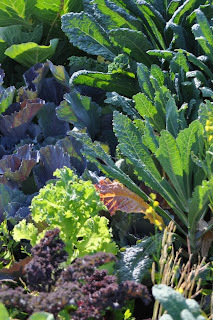 Twin Cities Urban Farm. At this 12 acre city farm growers with various talents ranging from tomato and potato farming to bee keeping and mushrooming have come together to grow food for urban eaters. This farm space has been the perfect place for us to launch our composting operations. 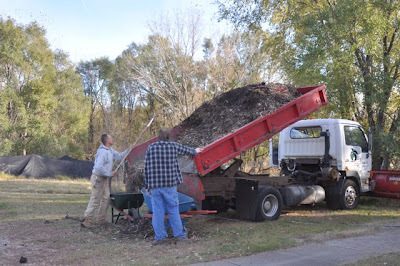 With consultation from local composting experts Peter Kern, owner of Kern Landscape Resources, and Professor Tom Halbach, from the University of Minnesota, we designed an 85 feet long compost pile. Friends of the farm and Giving Tree Gardens employees set to work transforming our greenhouse and hauling in the compost pile’s base layers of wood chips and landscaping waste. We now bring in 2 tons of Minneapolis’ finest coffee shop, vegetarian eatery, and beer brewery waste per week to compost inside our largest greenhouse. Composting takes place inside the greenhouse for two reasons. 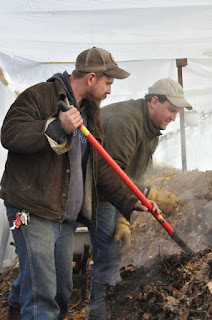 First, composting in the greenhouse means that our pile doesn’t stop cooking all year long. Second, and more importantly, the fact that we’re heating our greenhouse without any petroleum products means a huge environmental win for everyone involved. If you’ve purchased food, beer, or coffee from Peace Coffee, Caffetto Coffee Shop, Tao Foods, or Second Moon Coffee Shop, then you are contributing to healthy soils, and local food production at our Grow! Twin Cities Farm. If you’d like to support more of our farming and composting efforts, there are great ways to get involved. You can sign up to volunteer, donate to the farm, or sign up to follow our newsletter. Many thanks to all the hard working compost helpers! Is your block club, church group, or office place ready to go green? In this time of shrinking budgets we need to recognize the assets in our communities and help them grow into a sustainable future! 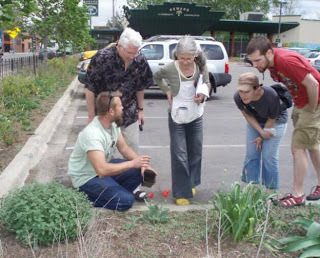 Community Design Forums are meetings where folks come together to create action plans for moving forward with changes that positively affect their community's environment. By sharing needs, knowledge, and ideas communities get to know the power within their ranks and discover ways to help grow their green ideas. 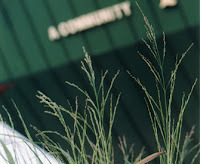 Facilitated by Giving Tree Gardens owner Russ Henry, these forums bring together his skills as a professional Earth-Friendly Landscaper and a volunteer Restorative Justice Facilitator. Russ sits down with consultation attendees and asks them to share their concerns, ideas, efforts, and knowledge with each other so that communities can not only draw from his experience in the garden and landscape, but more importantly, attendees learn about each other's skills and abilities. Giving Tree Gardens now offers our professional landscaping consulting services for all those do-it-yourself clients that would simply like a little advice. Many of our clients love to garden themselves, but want to have a professional on their side. In order to help folks get the most out of their consultation time, Russ Henry has designed the Healthy Yards, Healthy Lives Home Consultation! 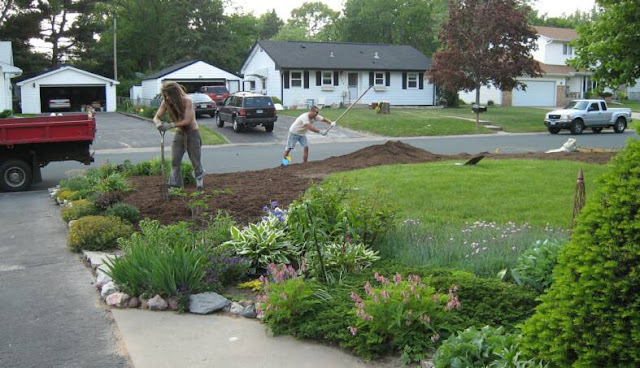 From garden design and layout, to landscape installation methods, and landscaping maintenance routines, to back yard organic garden food production and promoting healthy ecosystems, this landscaping consultation is a one-stop shop for improving the quality of life on this planet one back yard organic garden at a time! Giving Tree Gardens landscaping department offers year round garden and landscape maintenance services. Our landscaping maintenance crews are out maintaining our client's organic gardens and landscapes from the time the last snow melts in the spring till the ground freezes again in the fall. We'll maintain your landscape through the winter months with our trusted Snow Removal Service. Our landscape maintenance services include composting, weeding, perennial division, tree and shrub pruning, and mulching. 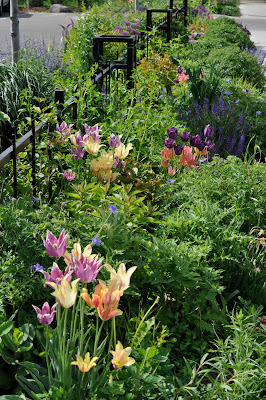 In addition our maintenance crews plant annuals in the spring and bulbs in the fall. Giving Tree Gardens landscaping maintenance crew makes sure your organic gardens grow more lovely with each passing season. 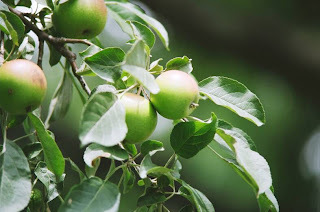 Giving Tree Gardens professional landscape and garden installation service crew work closely with our clients and with our garden designer Russ Henry to install award winning organic gardens. We use hand tools whenever possible and we keep our foot traffic to a minimum. Our organic gardens and landscapes are installed so that they will have all they need to grow healthy and full, and our organic garden installation services are designed around our clients needs and dreams. 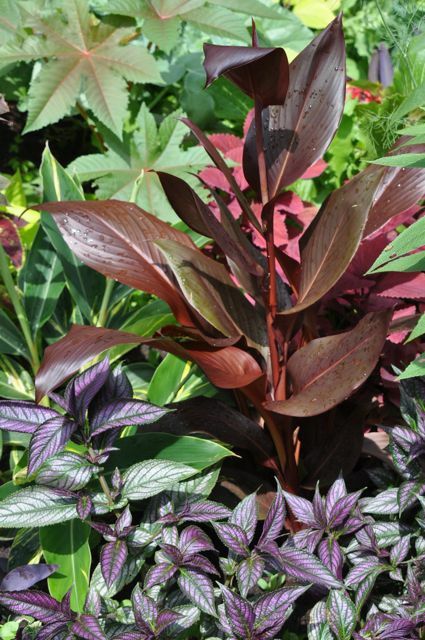 As owner of Giving Tree Gardens, Russ Henry works closely with each of his Landscape Design clients to create organic gardens that fulfill the needs and desires of each client. Giving Tree Gardens designs and services are each individually crafted to create functional enchanting spaces. We take the time to get to know how our clients will use their outdoor spaces, so that we can design their gardens to enhance the livability and pleasure they find just outside their doors. Giving Tree Gardens are designed to preserve nature, and provide all year-long beauty. "We aim for 100% client satisfaction" explains Russ Henry, "I want my clients to love the work I do for them, so I pay close attention to what they want to find when they step into the landscape." Video: Edible Landscapes, Food Justice, and more! 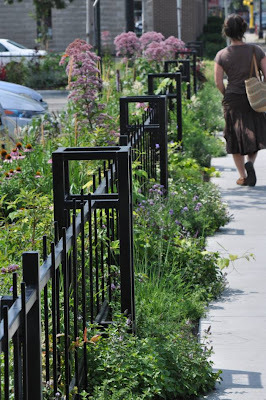 Gardening can make our urban areas healthier, safer, and more beautiful. In this brief video, Russ Henry speaks out passionately in favor of making Minneapolis a model city for environmentally sound practices. Here you’ll find links to some of our business, non-profit, and community partners in growing a more beautiful and bountiful Twin Cities for ourselves and future generations. Comgar Listserv: Gardeners Unite, Connect, Grow! Applied Energy Innovations: Solar, Wind, Geothermal? Midtown Farmers Market: Local, Fresh, Delicious! Reddy Rents: Huge Selection of Hand Tools For Sale and Rent! Diamond Stone: Oriental Medicine, real healing. and Giving Tree's Russ Henry. Food is the second medicine. We are spiritual beings having a physical experience. When our feelings are hurt or we’re down we might say our spirits are low. When we feel great we say we’re in high spirits. Our feelings are one reflection or dimension of our spirit that our bodies can easily perceive. Our bodies’ condition can affect our feelings and spirit. Hormones, wounds, illness, health, touch and sensuality, all of these physical realities in our bodies interact with our spirits to help us feel emotions. Water and food provide our bodies with the energy to continue hosting our spirits. It’s common knowledge that our bodies absorb the physical qualities of the food we eat when we digest it and strip it of usable nutrients. What would happen if folks everywhere started to recognize that the spiritual qualities of the food we eat are absorbed and used by our spirits? in their cooking? More then one professional chef has told me this and though I love to cook, I’m not a chef. By trade I’m a landscaper and composter. In my experience, the same ingredient that good chefs pour into every dish in order to bring flavor to life is also the most important tool we have for growing healthy food. Love guides any holistically healthy growing operation. Love of people, love of Earth, and love of life are a few of the tools that growers can use everyday in their pursuit of health. Do I know where my food came from? Do I feel good about the place that my food came from? Do I feel like my food is full of healthy living nutrients, or is it possibly tainted with poisonous pesticides? When we look at food from this angle we see that from the moment we purchase food, it begins having an emotional impact on our own spiritual health and the health of the planet, an impact that we are in control of by the power of our choice. When we honor ourselves we feel better. We honor ourselves when we give ourselves those things that are holistically good for us. We are fully connected in every way to this planet, the condition of the planet’s living systems guide the condition of humanity. To honor our environment is to honor ourselves. Our ancestors made our lives possible and our descendants will only know life if we leave the world in functioning condition for them. I’ve heard it said that we did not inherit this world from our elders, instead we borrowed it from our children. Prayers can come true if you live them. If I pray for a healthy environment then I need to work for and make choices that promote health in the environment. By this way of living I am empowered to work for a miracle, I like that because life on this planet seems like it needs a miracle right now. Water is the first medicine and food is the second. What is good for us is also good for our home planet. Clean water and healthy organically grown food have the power to heal our wounded environments, bodies, and spirits. starts with the roots of the community. Wherever there is a strong activist gardener population, you will find wonderful green ideas and initiatives sprouting up all over! Rain gardens capture and filter rainwater run-off, community gardens and urban farms grow healthy food for people, locally grown food requires less trucking which keeps our air cleaner, fruit trees on the boulevard provide habitat for migrating birds and meeting places for neighbors. A city full of healthy gardens is a sustainable city full of happy people. Each city in Minnesota has it’s own unique approach to sustainability. In this volume of the Seed, we’ll have a look at two cities in the metro area to see some great examples of how local governments work with residents to incorporate all kinds of great gardening into their sustainability plans in order to grow happy, healthy cities. 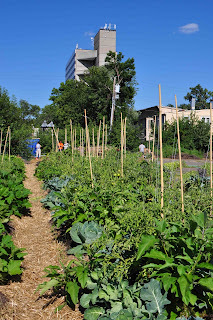 which is dedicated to nothing less then building a healthy, local food system for all Minneapolis residents. that will guide city land use decisions related to urban food production and distribution. The plan will help identify where and how land should be used to grow and distribute food through community and commercial gardens and urban farms. In short, this new ag-plan will help Minneapolis scale up to the next logical step in urban food production. By defining and allowing for urban farms, and market gardens, and by amending the zoning code to better accommodate urban agriculture this innovative plan will allow Minneapolis residents to have more control over their food choices, and more access to healthy homegrown food. Gayle reminds me as we talk about the city’s goal for having curbside residential compostable waste pick up by 2014. This point is especially powerful as it shows yet another great way to improve our environment and our gardening habits at the same time. When we compost we reduce the amount of garbage going to burners and landfills and we improve our garden soil, that’s the kind of sustainable solution we can all grow from. Oakley Biesanz, Naturalist for the City of Maplewood, explained to me some of the gardening strategies that are helping to grow a sustainable future for residents there. With over 620 city installed rain gardens now thriving in residents yards, 60 more growing on city owned land and many more to come Maplewood is proving that rain gardens are an effective and beautiful way to keep waterways clean and healthy. With the city’s support and promotion rain gardening has become the standard for dealing with storm water run-off in Maplewood. where Oakley works, the mission is to enhance resident’s awareness and understanding of land, water and wildlife resources; to empower the community to become stewards of the environment. 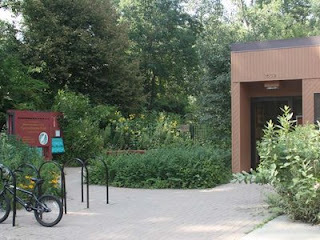 This mission is clearly evident in the Demonstration Gardens, which include rainwater gardens, woodland wildflower and prairie butterfly gardens and a small section of no-mow grass. This pledge to cut the grass no shorter then 3 inches and leave all the clippings on the lawn will help residents reduce fertilizer and watering costs and environmental impacts. Of course it doesn’t hurt that there’s a grand prize drawing for folks who are willing to take the pledge. are sprouting up in Maplewood this spring as part of a multi-city effort to improve access to food growing space. Working with the Maplwood-North St. Paul Parks and Rec. 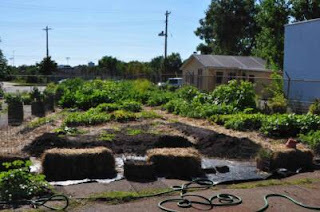 department, School District 622 and a local church, the two cities will now be able to offer over 650 community garden plots available to the public this spring. In the long run, sustainability is just a common sense approach to life, and gardening is the simplest approach to sustainability that we have available. Whether you’re filtering rain water run off through rain gardens in order to keep the ground water, rivers, and lakes clean or keeping nutrients in your neighborhood by composting in your back yard, or maybe even growing your own food and medicine at home or with neighbors in a community garden, these are all among the most Earth friendly, community building habits humans can all share. It takes a village to raise a garden and no one should be left out of the process. From youth to elders, from city council members to dirt gardeners, we all have a stake in helping to grow a sustainable city right where we live and we all need to work hard and connect with our community if we are going to see success. Gardeners, take the opportunity this spring to think globally, garden locally and start to grow a sustainable city! Best in Show! This picture I snapped last spring of a magnolia in the breeze was awarded a prize by The Men's Garden Club of Minneapolis. Would you like to learn more about our services & community engagement opportunities? Call (612) 227-0115 for more information or a consultation.